The ‘farm is located about 500 meters from the center of the village of Lari and offers a fantastic view of the Castello dei Vicari. The farm is family run, offers its guests comfortable apartments with private entrance large rooftop swimming pool and a large dining room with veranda where you can enjoy food prepared with care by the owners of the company. The owners are behind Farm sempe and will assist you during your vacation suggesting various activities you can practice in the area such as the Baths, the ‘horse riding, wine tasting and excursions to the nearby cities of Pisa, Florence, Volterra. The farm is very nice both in the interior than in the exterior spaces. Each apartment is equipped with air conditioning and satellite TV. The pool is surrounded by a garden decorated with fruit trees and olive trees. 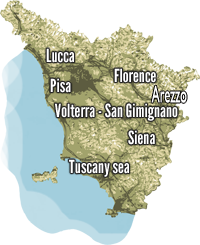 The area is perfect for anyone spending a relaxing holiday in the Tuscan countryside and visit the city’s most important art of this beautiful region. total price includes: towels and bed linen, cooking gas, electricity, water, parking, Wi-Fi, barbecue, swimming pool 15 x 7 x 1,40 m hmax (open from mid-May to mid-September), sat tv.